Only one of Philippe Garrel’s movies is called Jealousy, but most of the last several he’s made might as well have been, too. Sexual infidelity seems to haunt him, resurfacing in his oeuvre again and again; any romantic relationship he devises is all but doomed, sure to flounder when one or both parties inevitably stray. That wouldn’t necessarily be a problem, except that Garrel frequently tackles the subject with tiresome straightforwardness, as if nobody else had ever had done so in the history of cinema, theater, or literature. So it’s a pleasure to report that Lover For A Day, his latest effort, doesn’t get around to the cheating and resulting acrimony until the movie is very nearly over. While there is a romance, it’s mostly subordinate to the odd friendship that arises in its orbit. If Garrel’s recent films (which also include In The Shadow Of Women and Frontier Of Dawn) play like variations on a theme, this one at least varies more than usual. Even those understandably weary of seeing middle-aged men with much younger women will concede that the May-December pairing has a genuine purpose here. First seen frantically screwing in a university bathroom, fiftyish professor Gilles (Éric Caravaca) and his former student, Ariane (Louise Chevillotte), are still very much in the hot-and-heavy phase, to the point where she’s basically living in his apartment. (It’s not entirely clear whether she’s officially moved in or just rarely sleeps anywhere else.) Little does Gilles know that he’s about to have another houseguest: his daughter, Jeanne (Esther Garrel, the director’s own daughter, also recently seen in Call Me By Your Name), who’s just broken up with her boyfriend and has nowhere else to go. Ariane and Jeanne are exactly the same age, as it happens, and initially spend a lot of energy competing for Gilles’ attention. After a while, though, they become more interested in each other—not sexually, but with the sort of relieved intimacy shared by strangers who’ve experienced the same trauma. Each discovers a potentially explosive secret about the other and chooses not to divulge it. They’re in this together, even though “this,” as it pertains to Gilles, is an inherently unstable arrangement. Running a scant 76 minutes (the same length as Black Mirror’s new Star Trek episode! 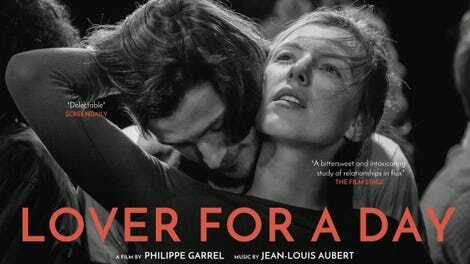 ), Lover For A Day explores its almost high-concept narrative via Garrel’s usual dreamy, glancing style. Few living directors are as accomplished at shooting in monochrome; his wide-screen black-and-white images, carefully composed for gray scale, never look like someone just turned the color off. They properly shimmer. So do the actors—especially Chevillotte, who plays Ariane with a scarcely concealed tremulousness that can solidify into steely resolve with startling velocity. Garrel tends to favor rather wooden young actors (including his son, Louis, who’s no Esther), so Caravaca’s rumpled, lived-in presence makes for a welcome change. Even the recurring use of omniscient voice-over narration, repeated from In The Shadow Of Women, proves more effective in this looser, somewhat playful context. Everything seems on track for a minor-key delight. Alas, this is still un film de Philippe Garrel, which means that someone’s eventually gonna sleep around. Ariane enjoys the excitement of a new lover too much for strict monogamy, and she and Gilles agree, without ever quite discussing the rules, that she’s free to bone other men so long as she’s discreet about it. But Ariane decides to hook up with someone at the university, where she’s spotted in flagrante by Gilles, and all predictable hell breaks loose. 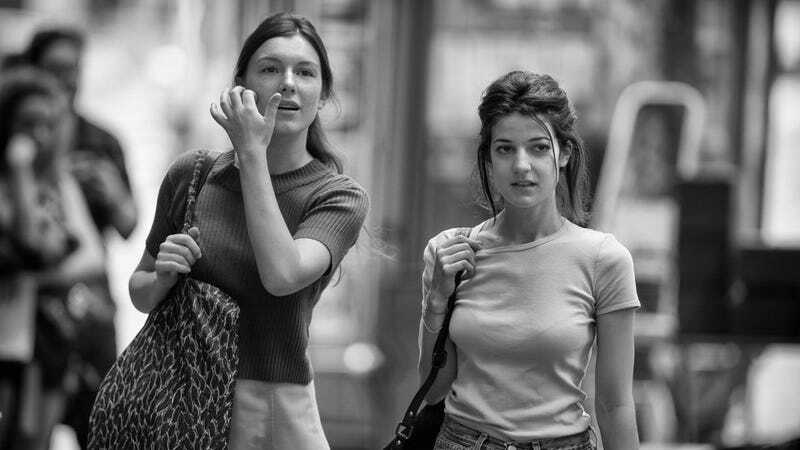 Garrel doesn’t really try to fit his obsession into this specific story—while Jeanne introduced Ariane to the guy in question, and might conceivably have done so as a means of ending her father’s relationship, that maneuver doesn’t credibly follow from what we’ve previously seen. Garrel just doesn’t seem to know any other direction to take a story, or two characters. That said, he came tantalizingly close to finding a new path this time. He’s only 69. There’s still hope.